Grand-prize winners will receive $25,000, and 10 second-prize winners will each get 100 pounds of pork. In North Carolina, the smell of success is the smell of barbecue. The Tar Heel State unveiled its newest state-sponsored lottery game last week: a scratcher ticket with a little something extra. That smoky scent, though, has left some Carolinians scratching their heads. In a video from the BBQ Bucks roll-out event at Clyde Cooper’s BBQ in Raleigh, only one of the people interviewed could actually smell the BBQ scent. 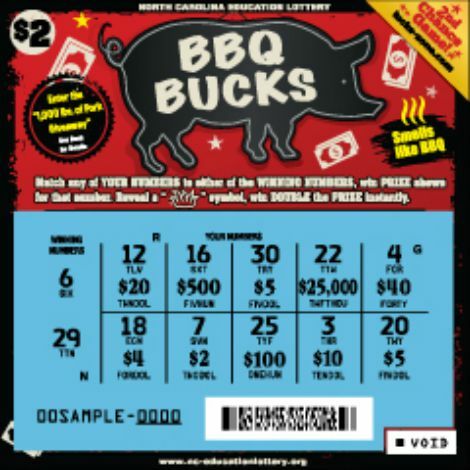 North Carolina isn’t the first state to come up with a pork-scented lotto scratcher. Colorado, Indiana, and New Hampshire all have bacon-scented lotto tickets (bring home the bacon!… get it?). It’s also come to our attention that Nebraska has a Sriracha-scented lotto ticket, so we’re moving there immediately. According to the Charlotte Observer, the odds of winning the top prize from the hickory-smoked BBQ scratchers are one in 888,000. Good luck!